The Structure and Function of Muscle, Second Edition, Volume III: Physiology and Biochemistry presents the physiology and biochemistry of muscle. 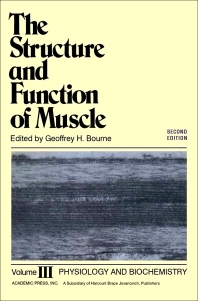 This book discusses the various aspects of the structure of muscles and explores some aspects of muscle disease. Organized into 10 chapters, this edition begins with an overview of the transverse tubular system or T system of striated muscle. This text then examines the properties and function of membranes through electron microscopy. Other chapters consider in more detail from a biophysical viewpoint certain aspects of the series of events surrounding muscle contraction. This book discusses as well the significance of the central circulation and the amount of oxygen that can be delivered by the cardiovascular system. The final chapter deals with the heat output and chemical breakdown during an isometric twitch. This book is a valuable resource for scientists, neurobiologists, biologists, biochemists, physiologists, histologists, cytologists, and research workers. III. Tubular Capacity—Lumped or Distributed?